Happy August! 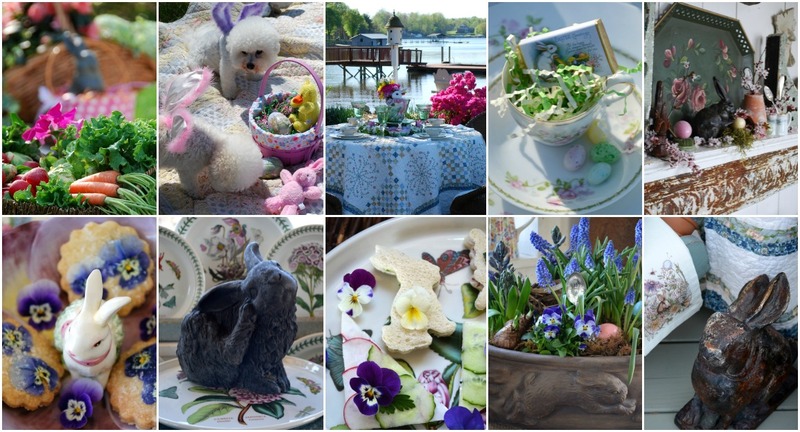 I gathered some flowers and floral arranging tips from the archives for a little flower therapy! I like to pick up flowers at the Farmers Market in the summer for a flower fix. . .a cheery bouquet is a guaranteed spirit lifter for the summer heat and humidity and the August blues. You can combine flowers from the garden and grocery store to create your arrangement. Trader Joe’s has a great selection of affordable fresh flowers if you’re lucky enough to have one near you. If you don’t have flowers blooming in your garden, don’t overlook the foliage or berries from shrubs, or branches you may have in your yard or that can be collected from a vacant wooded lot or greenway in your neighborhood. Sometimes I start with foliage as the framework before adding the flowers, especially if they’re the same variety or size, like with this Chick-fil-A Bouquet for Mother’s Day. Other times I start with the flowers first and arrange as I go. 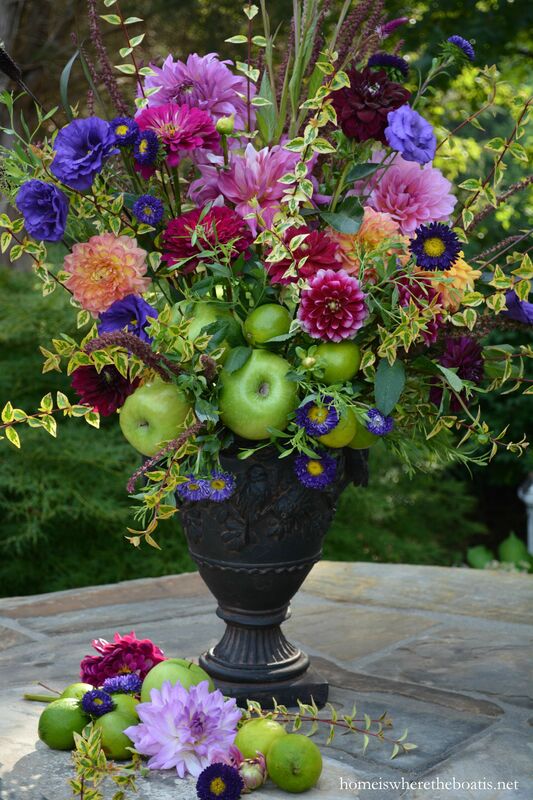 I like to add fruit and/or vegetables to mix with the flowers in an arrangement. They add texture and interest to your arrangement and you need fewer flowers. When it comes to arranging flowers, think outside the vase. A vintage tea kettle can make a charming container to fill with garden flowers. Or an enamel bucket can lend a cottage or farmhouse touch to the porch with an easy method for arranging flowers and greenery from the garden, using a wide mouth vase or smaller bucket nested inside a larger one. To keep cut hydrangeas from wilting, use the ‘alum-dipping method’, dipping 1/2 inch of each stem in alum powder, found on the spice aisle at the grocery store. Experiment and combine materials that might seem like an unlikely pairing, like blue hydrangeas and ‘Jack Be Little’ pumpkins, in this Just Because arrangement. Flowers are naturally beautiful, so let your materials be your guide and do what’s pleasing to your eye, rather than following ‘rules’ when it comes to arranging. Use a piece of chicken wire to provide support for flower stems in your arrangement. Hosta leaves between the walls of the glass vases hide the mechanics of the chicken wire and the flower stems for this alfresco garden table. Or put those plastic netting bags to work that produce comes in, usually citrus and avocados, to make flower arranging easy with a Garden Bouquet DIY and Recycling Flower Arranging Hack. The plastic netting bag is strong and flexible, making it a perfect material to support your flower stems, and to upcycle and reuse, instead of throwing it away. Cut your flowers and greenery in the morning when the stems are fully hydrated and not water-stressed from the heat. Strip the leaves that would be below the waterline, removing the excess foliage, and damaged petals and recut the stems at a 45 degree angle for maximum water uptake. Place them in a clean bucket with room temperature water and some floral preservative to condition them and let them sit several hours or ideally, overnight. 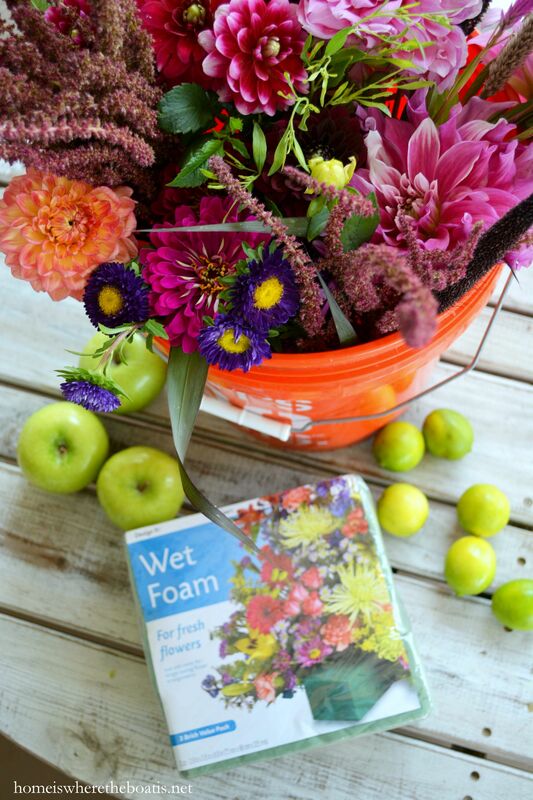 If you’re using wet floral foam, use the “float soak” method and place the floral foam bricks on the top of a solution of fresh water and/or floral preservative. Let the floral foam gradually absorb the water until it’s fully saturated. Plunging the floral foam in the water traps air bubbles and will prohibit the transfer of water from the foam to the flower stems. If you don’t have any commercial floral preservative to add to your water, you can make your own to help your cut flowers last longer. There are a lot of homemade solutions and theories about adding aspirin, vinegar, vodka, bleach, sugar, and pennies to your vase water to prolong the life of your flowers. Change your vase water every two days, recutting your stems when you change your water. Playing with flowers brings enjoyment to yourself and to others. . . I thrilled to have a surprise visitor drop by while I was taking photos of my flowers . . .
A monarch butterfly stopped by for a little nectar sipping from the magenta celosia. 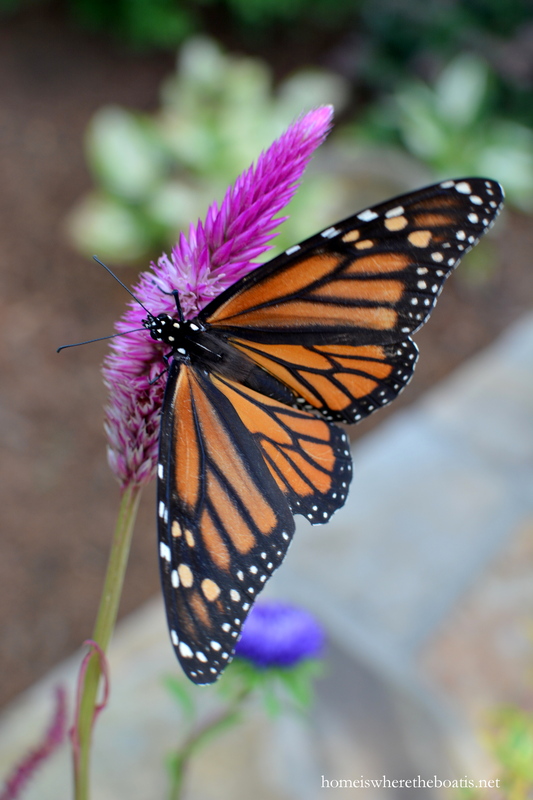 I was all aflutter over a second monarch butterfly sighting in a week! You are so very talented! 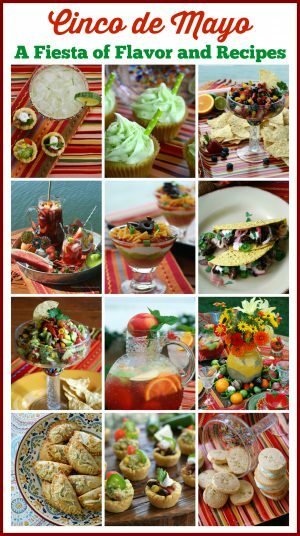 These are all so full and beautiful (and so are the backtracked posts! ), each one with a unique look. I love that Chick-fil-A bouquet dialog, lol. 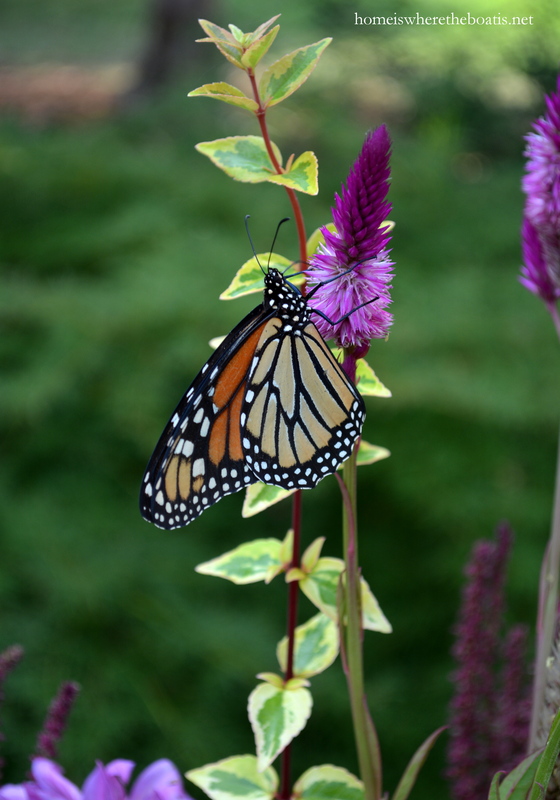 I had a monarch visit my garden yesterday evening too – excited to have captured it with a few photos. I may have already pinned one of these individual tip posts, but this one deserves another – great assemblage of tips. Thank you! Wow, fabulous post! Your flower arrangements are just the best. I’m always so impressed with all of them. Your color choices and sense of balance are spot on. Thanks for all the great tips in this post. I study ikebana and next time I use hydrangeas I’m using the alum. I did an arrangement with hydrangea for an exhibit and they wilted! Luckily I had back ups. Love, love love your pictures and tutorial my favorites being the tea kettle with the Queen Anne lace and the butterfly visit. Keep up the flower arranging as I need much help. Wow…loved this posting. Very creative and informative! Thanks! Your flower arrangements are fabulous! Thank you for sharing these beautiful photos, so creative! everything! I did not know about letting the foam gradually absorb the water – I always did the plunge method!! 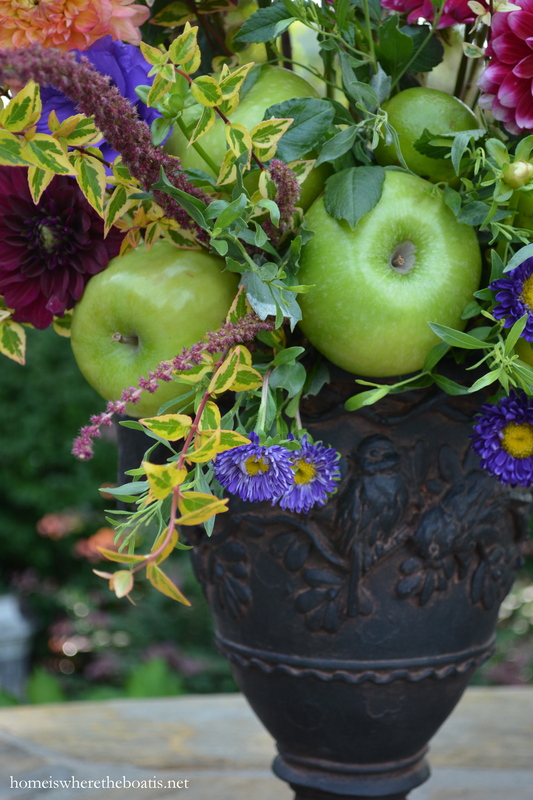 Love the creative use of urns and containers–THANK YOU! How lovely! Thank you for the great inspiration and the how-to-go-about-it! I’m a new fan! Wow, this has to be one of my favorite all time posts. Awesome information and your arrangements are stunning. How beautiful all your arrangements are! And thank you for the tip using Alum for hydrangeas. I never knew to do that! I always admire your artful floral arrangements Mary, real masterpieces they are, and I appreciate the reminders of all the clever tips and tricks you’ve shared, thank you! I have some of those jar grids, totally forgot about them! Also love the hosta leaves submerged and the vessel within vessel method. Wonderful arrangement ideas! Thanks so much for always making this blog visit a special one! 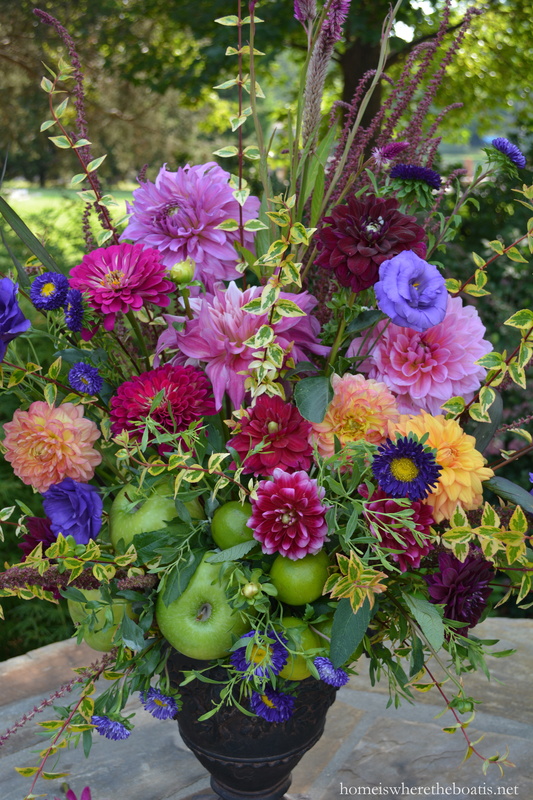 You possess an encyclopedic mind and vast talent for the fine art of floral arrangements! Your arrangements never cease to take my breath away, each and ever time that I see them. My Gram used to say that “flowers were God’s love made visible.” I have to agree. I heard the story of Queen Anne’s Lace from her. It grew wild all over her fields and often appeared in her arrangements. Thank-you for gathering all of your tips together in this beautiful post. SUPER! What a wonderful, beautiful post. Thank you for sharing your floral tips. Mary, you truly have the “magic touch” with flowers. Beautiful! Absolutely beautiful! A nice break from my day…. 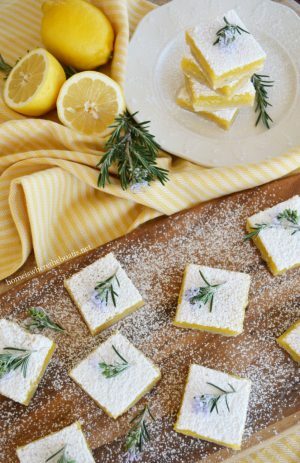 Does the alum method good for all flowers? I’ve only tried it with hydrangeas that are notorious for wilting after cutting. You can certainly try it with other varieties. Love this post! Never knew the bleach trick – I would have been afraid to try that. My sunflowers are already wilting – So I will have to try one of your tricks on them and see if they will last a little longer. Thanks much!! I SO Love to see a post from you….makes me happy! You are so talented in every thing. 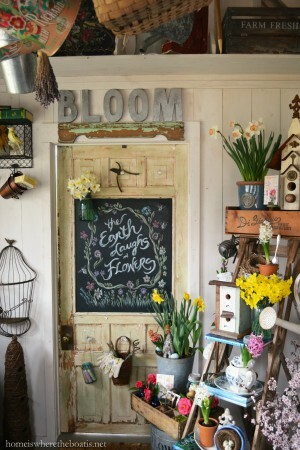 I love flowers and seeing what you have decorated in your Potting Shed….and the fur babies. I’m not a cook but your table settings are beautiful also. Thanks for the tips today. I had no idea about the alum trick! So glad I caught this today for that alone! Your hosta leaves are so pretty, I used to have so many different hostas in Ohio, but alas, can’t grow those in Florida. I miss them, but I can grow foxtails outside year round and use that foliage a lot in my floral arrangements. Mary, your creativity and talent are both so amazing! Flower therapy is better than retail therapy! Gorgeous arrangements, full of color and texture! 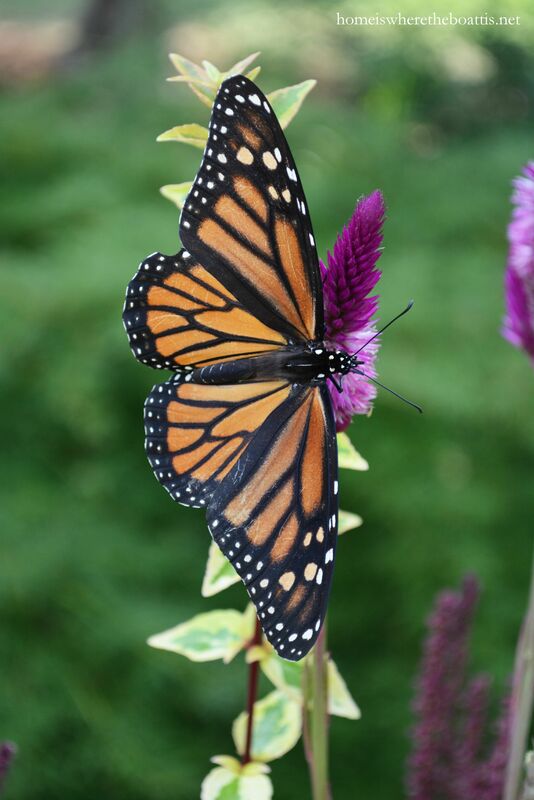 The Monarch sightings are so exciting, I am hoping to see some flitting around my garden. Those pumpkins are a good sign, Autumn is on the way! I love those Pansies. They are beautiful as are all your flowers. Those Monarch butterflies are gorgeous. Thanks for sharing your lovely garden. The color of the flowers, and all the arrangements you made are absolutely Beautiful !!! I’ve always loved your arrangements with fruit and that’s something I’ve not done and I should. 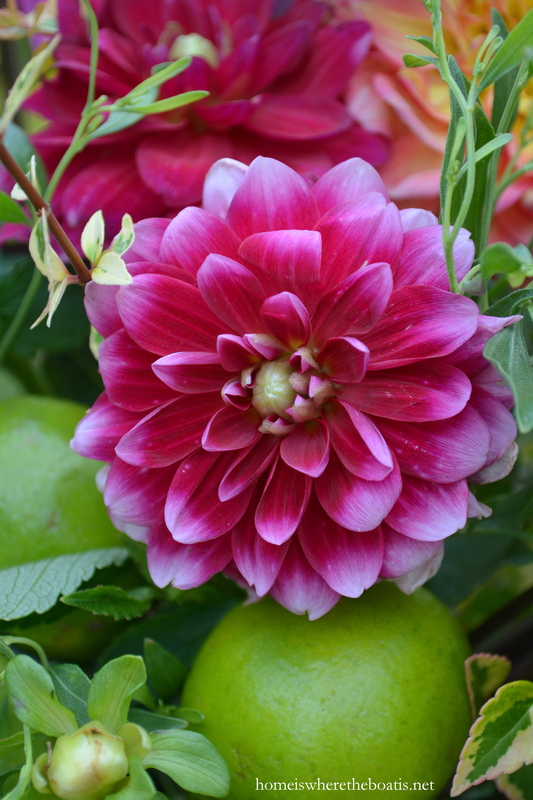 Dahlias and zinnias are the essence of summer flowers to me. Adding an assortment of greenery from the garden makes any arrangement special I think.I also like using hosta around a vase. Looks pretty. I’m excited you have seen two monarchs in a week. Maybe they have laid some eggs. That would be wonderful. So pretty Mary! Thanks for all the great tips. Will pin for sure! SOOOO much beauty (and info) all in one post! Mary, you continually outdo yourself, to our delight! You could be a professional florist for sure. I never thought of using the produce bags! I always come away from your posts with some new knowledge, so thank you! Your flower arrangements are just spectacular. 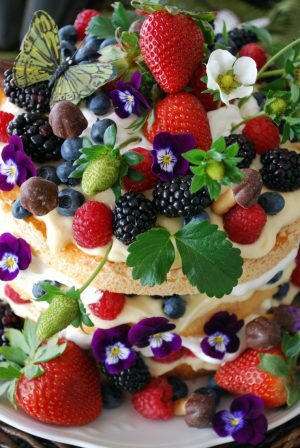 The way you combine different colors, flowers, and fruit is so artful. I pinned a ton of your beautiful photos. Thanks so much for providing such inspiration. You are so talented with your floral arrangements! I wish I could follow you around for a day and just watch. So inspiring! So much beauty, I keep thinking I will have a color filled future to start playing again, although it will be a long time coming! You have me craving fall, it’s all gorgeous. And so dang fun to have your blog load again! So many gorgeous flowers here as well as excellent tips. I’m headed to Trader Joe’s tomorrow to buy my flowers for the weekend. I’m so lucky to have 3 TR stores easy distance from me. Have a great weekend! Mary, I had to stop in to thank you for sharing at Gardens Galore! Have a wonderful week! Hi , beautiful post and very helpful. How do you anchor fruit especially lovely pumpkins. Was very interesting !!!! I love flowers, esp Lavender ones !! !